Devil May Cry 5 Review: Dante and Nero are back, and they've brought a few new friends with them. What do we think of the demon-slaying adventure? There’s a moment in every action game where everything just clicks. In Devil May Cry 5, my fumbling button presses suddenly transformed into extraordinary combos that saw enemies thrust into the air before eating a gauntlet of bullets from my demonic revolver. As all of this happens, the game punches up a grade on the screen, and the accompanying guitar riff shows that, in this moment, I’m badass incarnate. 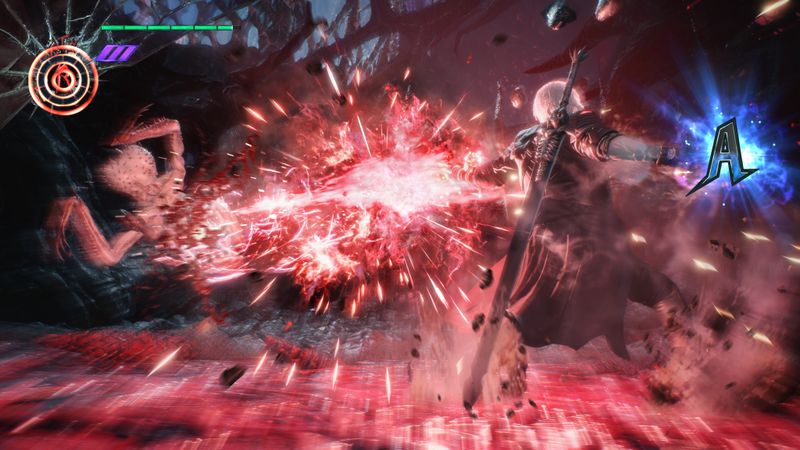 It can take a while, as Hideaki Itsuno’s latest entry in the Devil May Cry hack ‘n’ slash series requires you to memorise and chain together different skills for maximum style. But once you’re on solid footing, it’s immensely satisfying watching hordes of demons dissolve into viscera in front of you – only for them to beat you to pulp once you surpass Devil Hunter difficulty. Whatever your cup of tea, Capcom has brought Devil May Cry back into the limelight with an excellent new instalment. The goofy, juvenile escapades of Dante and friends have proven themselves timeless, even if underworld threatens to overthrow them a few times along the way. For the newcomers amongst you, Devil May Cry 5 does expect you to be familiar with a wide range of characters and the series’ past mythology, but that isn’t to say it’s hard to follow. It’s a simple tale of good and evil battling it out, and the ‘History of DMC’ option in the main menu does an exquisite job of helping potential newcomers get up to speed. 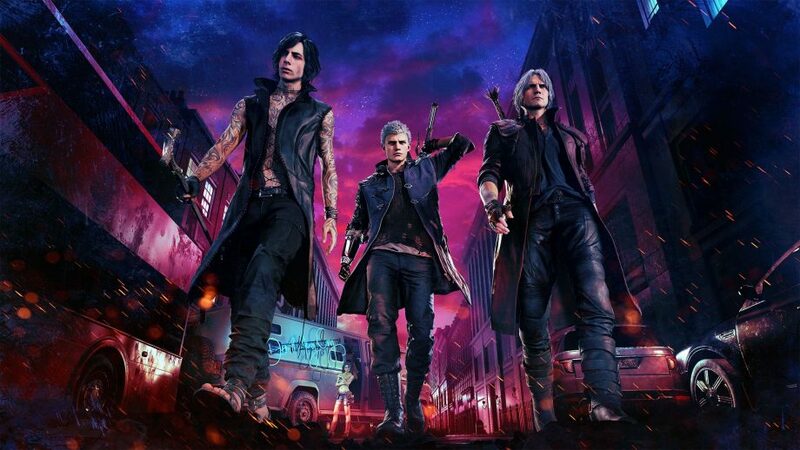 Taking place after the events of Devil May Cry 4, Dante and Nero find themselves working alongside newcomer V to battle a mysterious villain named Urizen. Red Grave City has become a nesting ground for demonic creatures who feed on human blood, unfortunately putting the entire populace on the menu. After being bludgeoned to a pulp in the opening minutes, Dante is left trapped while Nero must retreat and lick his wounds. Without his trusty demon arm, Nero must make do with a mechanical Devil Breaker appendage designed by his BFF Nico. The Devil Breakers are Nero’s defining mechanics. One transforms into a flaming sword while another attachment freezes time, providing a window to whale on baddies with no consequence. Switching between the mixture in your inventory is a thrill, providing every encounter with a layer of nuance. A heavy strike from an enemy will cause most Devil Breakers to, well, break on impact. Or, you can opt to explode them yourself with a press of the shoulder button to deal massive damage. It’s all about deftly avoiding incoming attacks and finding the perfect moment to strike, building up style ranks as you do. Don’t worry, new arms are easy to come across. Nero feels amazing to play, and could easily carry an entire game himself, except you’ve got two more to play with. Dante, the franchise poster child, plays exactly like he did back in 2005 with Devil May Cry 3. Wielding his trusty sword Rebellion and twin firearms Ebony and Ivory, Dante is also capable of special skills across four unique categories: Swordmaster, Gunslinger, Royal Guard and Trickster. Of course, the devilish demon slayer has a few new tricks up his leather sleeves. Later stages see him wielding elemental nunchucks and a supernatural motorcycle that can be split into two at any moment to clobber foes. Such versatility made Dante my personal favourite, switching between weapons instantly to splice together some otherworldly combos. Oh, and where can we buy Nero and Dante’s coats? They’re bloody fabulous. Now we move onto V, a newcomer to the series who loves himself some gothic literature and My Chemical Romance cosplay. 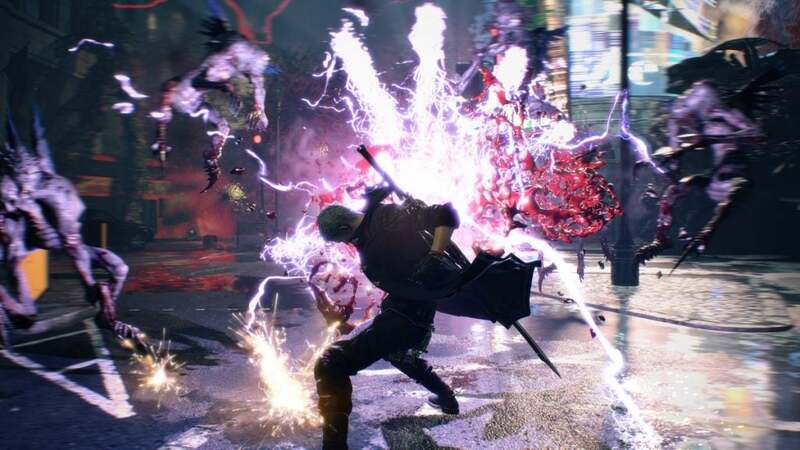 To be blunt, he’s the weaker link in Devil May Cry 5, but is a curious achievement in ambition when it comes to pushing out the boat of tropes the genre is known for. Instead of getting up close and personal with the competition, V stands back and commands a trio of shadowy beasts to do his bidding. These come in the form of a Griffin, Panther and a bulking nightmare that drops down from the sky with a score of explosions. In essence, they’re treated like living, breathing weapons you command on a whim. You’ll need to mediate your aggression, as consistently throwing your comrades into the fray will lead them to death, meaning you’ll need to hang around their corpses until they respawn. This can take a few seconds, leaving V’s vulnerable form open to attack from all angles. Juggling offense and defense is enjoyable, but at times it feels like your wild arsenal fumbles about aimlessly instead of attacking the threats you highlight. It’s nothing major, but ruins the buttery smooth flow Nero and Dante offer in abundance. With V, you can hammer buttons and hope for the best, nullifying a lot of the charm on lower difficulties. 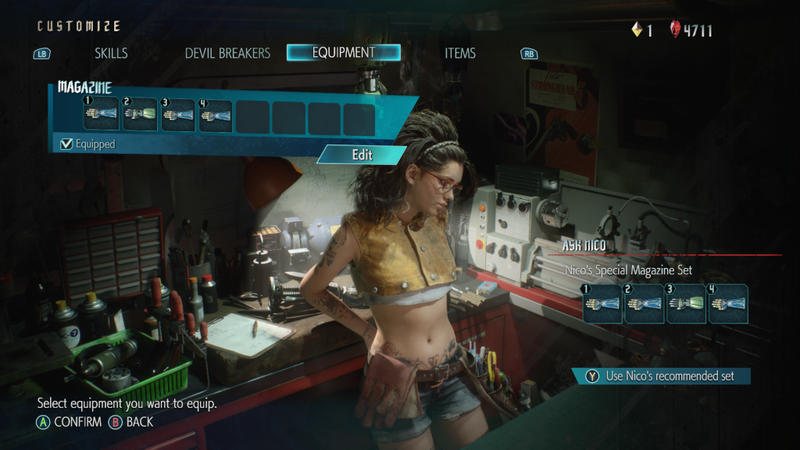 Despite a few niggling issues, V is still a welcome slice of variety in Devil May Cry 5. Having to re-analyse situations you previously thought mastered with new techniques is exciting, as is hanging back and watching as you command a platoon of demonic forces. He also plays a vital plot in the narrative, which is an exciting race against time across Red Grave City. Clearly based on London, Red Grave City is a dank, industrial metropolis that has been overtaken by Urizen and his army of blood-thirsty demons. The opening levels have you sprinting through fictional parallels of Piccadilly Circus and London Bridge before descending into Red Grave Underground to battle through abandoned metro tunnels which are crawling with hostile threats. Sadly, the pacing of Devil May Cry 5 means you don’t spend nearly enough time getting to know Red Grave City. Instead, you’ll be navigating organic towers that Urizen calls home, a H.R Giger-esque mixture of living, breathing walls and claustrophobic corridors. They grow repetitive before the end as I was begging for a bit of fresh air, or just a few more minutes to take in the streets of Red Grave. You’d think working through countless red gates, dispatching all the enemies in sight and moving on would grow old, but Devil May Cry 5 felt so wonderful to play that any repetition fatigue was banished to the back of my mind. Every new battle is a golden opportunity to grow, encouraging experimentation with newly acquired skills from the robust upgrade system. Stages are short enough that I’m already well into my second playthrough, realising the full potential of each character that went previously unseen. It feels like everything really comes alive in Devil May Cry 5 after the credits have rolled, encouraging you to dive into the chaos and never look back. Ample collectables that revel in creativity only made the package more appealing. You’ll also discover a handful of secret missions which require you to complete specific objectives. These are fun excursions with worthwhile rewards, and prove to be shockingly hard to find amidst the game’s levels. Seriously, you’ll need to stop and stare for a few minutes to discover some of the later secrets. Like me, you’ll likely be tempted to smash that new game button seconds after the credits roll, but that doesn’t mean I was entirely satisfied with the overall plot. It muddles character motivations yet concludes in a positively grin-inducing way, but feels too brief, too shallow, and too intent on paving the way for expansions and sequels instead of tying up loose ends for a satisfying conclusion. 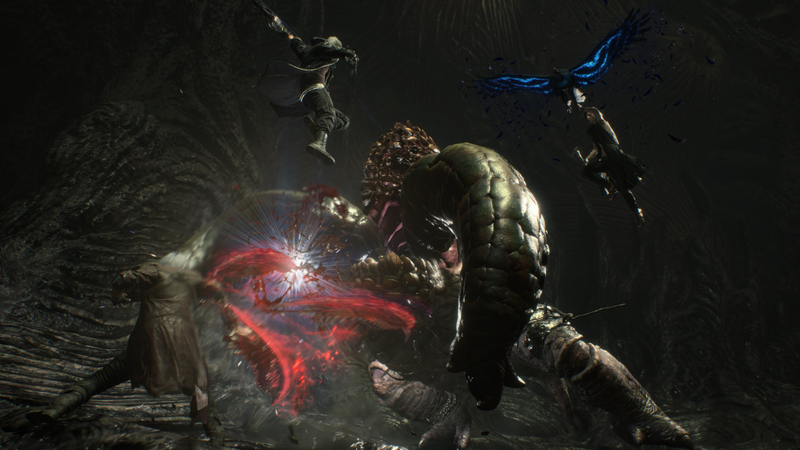 Much like Resident Evil 7 before it, Devil May Cry 5 carves out an exciting future for the franchise with new locations and characters that don’t just drag Capcom’s hack ‘n’ slasher into the modern generation, but carve out a spot at the head of the table, too.